Last month, Zohra was on a panel chaired by Shelina Janmohamed discussing Generation M at the Wilderness Festival (Shelina is the author of Generation M: Young Muslims Changing the World ). Following the talk, an audience member came up to Zohra to tell her about a new, fine dining, fully halal, alcohol-free restaurant in Zone 1 called The Great Chase. Turns out the restaurant had already contacted us and Zohra very kindly waited for me to return from my holiday before we headed to The Great Chase to see what they had to offer. Upon entering we were greeted by Mabruk, one of the owners of the restaurant. He explained the concept to us and we were really impressed to hear about how much thought had gone into not just the food but the drinks too. It’s great talking to restaurant owners who understand that there is more to the word ‘halal’ than just the way an animal is slaughtered – getting that message out there is one of the reasons why Halal Gems was founded (read our Manifesto here for more on that). The meat, seafood and vegetables at the restaurant come from local, free-range and organic sources which makes the food at The Great Chase not just halal, but tayyab (wholesome) too. Having browsed the menu we started off with the Flamed Mackerel which was served with buttermilk, pickled cucumber and dill. Zohra really enjoyed the starter but I wasn’t a fan – I just find mackerel to be too fishy. If you like mackerel generally you won’t be disappointed with the dish which has now been updated to replace cucumbers with pears. I’ve grown to dislike ‘mocktails’ and rarely order them as I find them to be full of syrup or sugar (I once saw a waiter pouring cheap supermarket branded lemonade into a £5 mojito I’d ordered – I won’t name and shame the restaurant). However, the alcohol-free cocktails at The Great Chase were just that – cocktails without the booze. Prepared carefully and creatively, these alcohol free drinks weren’t the sugary mocktails we had become accustomed to at halal restaurants but great tasting non-alcoholic cocktails with complex flavours. I ordered the ‘Tayberry Spritz’ which was a berry based drink made using a tayberry and rose cordial, Bees Knees fizz and a black pepper & lavender vinegar mist. Zohra ordered the ‘Seventy-Five’ which was made using Gimlet Gorse cordial, fresh lemon, Bees Knees Brut and juniper. If you prefer berry-based drinks that aren’t overly sweet, the Tayberry Spritz is for you. If you normally order a non-alcoholic mojito at restaurants you may enjoy The Seventy-Five which has a stronger flavour featuring citrus tones. 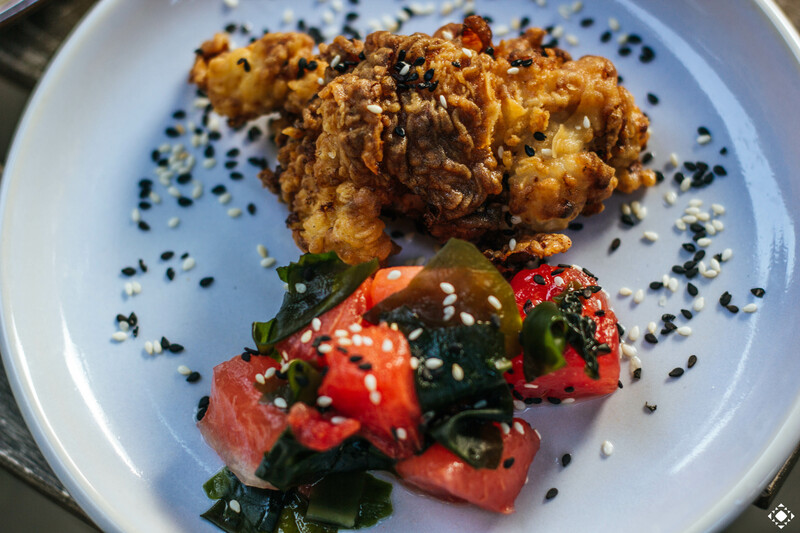 Our second starter was the Buttermilk Chicken which was served with pickled watermelon, seaweed and sesame. Our initial thoughts when we saw this on the menu was ‘what does pickled watermelon even taste like?’. Once it arrived, we took our dishes outside to take some photos and Mabruk helpfully mentioned that if we left the dish too long the watermelon juice would make the buttermilk chicken soggy. Unfortunately my pursuit of the perfect photo meant the chicken was slightly soggy at the bottom when it came to actually eating it but the top was beautifully crispy. The pairing of the watermelon and seaweed with the chicken left us pleasantly surprised. As we sipped on our alcohol-free cocktails waiting for our main course to come out, Mabruk asked us to try two more of their drinks – the ‘Garden Tonic’ and the ‘Bees Knees Sparkling Rosé’. The former consisted of an elderflower & sweet cicely cordial, elderflower & lemon vinegar, tonic and cucumber while the latter was a pink grape and green tea infusion. The rosé was the only drink to come straight out of a bottle on the night but we enjoyed the flavours of both. The ‘Garden Tonic’ was stronger than the other drinks we tried and we reckon it wouldn’t suit everyone’s tastebuds. The Rosé had what I am only articulate enough to describe as a smell that resembled alcohol (remember there is no alcohol in any of these drinks). When we were returned a week later for brunch with Ayesha from My Big Fat Halal Blog she also tried the rosé agreed with our comments. The moment Mabruk described the steaks to us and the farm to fork process we knew exactly where they had come from. Zohra and I had visited a farm near Milton Keynes on a cold winter’s day last December with with Usman (founder of Hill Farm Finest) and HaloodieFoodie. We spoke to the farmer who explained how the animals are raised and slaughtered and stepped into the chiller to see how the ageing and packaging process works. The option of a 32 day dry aged Angus steak from Hill Farm on the menu was one we could not resist and we opted for the rib eye (they also offer a sirloin). The steaks had just come in the day before and were being served with pickled shiitake and a homemade beef dripping butter. Our choice of a side was the Cornish New Potatoes served with anchovy butter and pink pepper. The steak was cooked to a perfect medium and served sliced which we really appreciated (less work, more food?). The beef dripping butter melted on top of the steak and the steak itself was juicy. It didn’t require much effort to cut and The Great Chase proved our theory that all you need is a high quality, organic steak to create a great meal. We had high expectations knowing it had come from Hill Farm and the chef had got it spot on. Zohra was convinced she had met the very cow from which the cut had come from (watch our video of our visit to Hill Farm here). I had my eye on the Chocolate Mousse the moment I saw it on the menu earlier in the evening. I can’t resist any dessert that has chocolate in it and I happily tucked into a creamy and light mousse served with strawberries and hazelnuts. We also ordered the Whipped Cheesecake which was served with passionfruit, cookie crumble and basil. The whipped cream cheese balanced out the tang from the passionfruit. 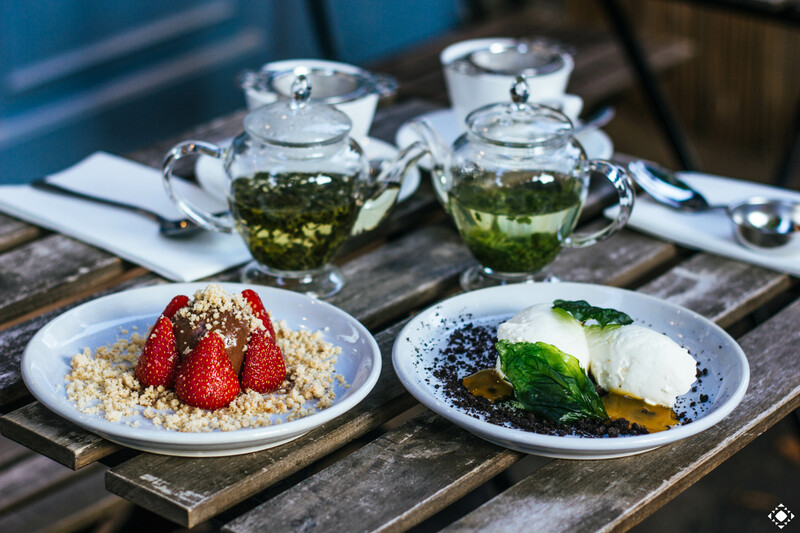 As recommended on the menu, we also ordered an Emerald Green Tea with the Mousse and a Sencha Tea with the Cheesecake. This all made for a delightful end to what had been a fantastic meal. The restaurant is small which creates an intimate setting. The low lighting and soft music created the perfect ambiance. They also have seating outdoors which I’d imagine would be nice on warmer days (or as a spot for taking photos of food in natural lighting like I did). Normally I look up a restaurant on social media and view their menu before I visit but I tagged along with Zohra having no idea what was in store. The Great Chase is one of those restaurants where you will order a dish with pairings you are unfamiliar with and be pleasantly surprised. The chef and team have come up with a creative menu and have not compromised on quality and taste. As far as halal fine dining goes, there is nothing like The Great Chase around. After all where else can you find a fully halal, alcohol-free, fine-dining restaurant in central London that serves organic and tayyab meat? Halal Status: All meat served is halal and organic. No alcohol is served. Discover great halal restaurants near you using the Halal Gems Restaurant Finder App. Download it for free on the App or Play Store here. Check out our video review of The Great Chase on YouTube. Ruman eats a brownie a day, but only with coffee. She struggles to eat more than 2/3 of an adult size portion of food, but always has room for dessert. When not exploring restaurants, galleries or cities around the world, Ruman is a Marketing Ninja at Halal Gems, where she also holds the title of Chief Chocolate Officer. Forever consumed by a mixture of wanderlust and FOMO, her interests include all things social media, travel, charity, photography and food. You can follow Ruman on Instagram and Twitter.